In 2012 two medical students from Albany Medical College, New York, Ajay Major and Aleena Paul, founded in-Training, an online forum where medical students could record and discuss their thoughts as they learnt the art and science of medicine. Since then, they have published more than 850 essays, poems and reflections written by medical students. 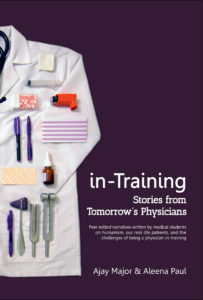 From this, Major and Paul have distilled the finest contributions into one printed collection, in-Training: Stories from Tomorrow’s Physicians. It is quite a collection. In its dense 347 pages, it covers a wide range of topics and themes germane to medical students and doctors in training, from pre-clinical studies (the book opens with a section devoted to the dissection lab); to memorable patients, their diagnoses and prognoses, their discharges and deaths; to the introspective struggles of medical students such as living up to the image of a physician, work-life balance and professionalism, as well as burnout and mental ill-health; to taking the pulse of systemic ills such as poverty, racism and global health. Essays and prose reflections are intermingled with poetry, and each entry is tailed by a few questions to direct the reader’s own reflections. Having completed my undergraduate medical education, I initially found this book difficult to get into. While the prose is articulate and well-written, most of the entries hardly struck me as particularly insightful or inspiring. The contributors are all medical students in various stages of training. As such, their reasoning is still a little green, their conclusions perhaps a bit too simplistic and naïve. But to mark this book down for that is to miss the point. This is not, and was never meant to be, an anthology of professional and professorial essays on the witness and practice of medicine. Instead, there is a gestalt feeling of many diverse minds actively reflecting, documenting how they are affected by the business of (learning) medicine. When viewed from the other side, as a fledgling medical student, this book offers solace and encouragement that there are others out there grappling with the same or similar issues. With this in mind, I see how the in-Training website has become so popular. The contributors are all training in the USA. This does distance readers from elsewhere, such as myself, but there is still enough commonality to the experience of medicine and medical school that it does not affect the reading too greatly. As mentioned earlier, this book is densely packed with essays and poetry, both in terms of themes addressed, and the sheer number of reflections included in the anthology. There is the feeling that Major and Paul would have included even more essays if possible. It is difficult to read through continuously, unlike the reflections and memoirs of a single doctor, because of the constantly changing narrative tone, style and voice. The converse in fact is true, as in-Training: Stories from Tomorrow’s Physicians provides a deep spring to dip in and out of at the reader’s leisure. It is also supremely convenient for tutors of medical humanities and reflective practice to be able pull out selected essays for their students to read, complete with prompts for guided reflection. Writing in BMJ Careers in June, Dr Daniel Furmedge1 proclaimed that written reflection was dead. Voicing concerns that junior doctors’ reflective entries in their training portfolios at best serve no purpose, and at worst may be used against them by the hospital trust or lawyers, Dr Furmedge foresees that junior doctors in the future will write meaningless anodyne reflections. in-Training: Stories from Tomorrow’s Physicians serves as a corrective against such pronouncements. It details numerous and diverse medical students who have been affected by what they have learnt and seen and done. There is no reason to think they will grow up to be areflective doctors. Written reflection is very much alive.